There are many reasons why one wants to use the latest Go, but with the upcoming 1.8 it is especially nice as it finally seems to feasible to expose Go based HTTPS servers directly without putting another HTTP server (like Nginx) in front. As the current Ubuntu 16.04 LTS only has Go 1.6 available in the repos, I created a PPA which has the various bits and pieces backported from next Ubuntu to provide Go 1.8 on Ubuntu 16.04 now. You can update your system from my Golang backports PPA by adding ppa:longsleep/golang-backports to your system’s Software Sources. See https://launchpad.net/~longsleep/+archive/ubuntu/golang-backports for the list of packages. Adding this PPA will update the default system Go to 1.8. Please note that Go 1.8 is still in beta at time of writing. As i was dissapointed by the high prices of Google’s Nexus 5X and 6P i got myself a OnePlus 2 64GB. The device arrived within 8 days from China and i have completely switched over from my old Nexus 5 to the OnePlus 2 running Exodus Android. Replacing the stock OS was easy and straight forward so thought i could share some quick instructions. I assume that you already got the Android platform tools installed - you need fastboot and adb. Command line examples are for Linux. If these tools mean nothing to you, then these instructions are probably not for you. The OnePlus 2 is similar to the Nexus devices and supports fastboot. Unlocking the bootloader will wipe the device - so only do this if you have a backup! To put the OnePlus 2 into fastboot mode, shut it down and then press and hold volume up and power button until the logo appears. Check with sudo fastboot devices - the device needs to appear there. Unlock the device with fastboot. This will show some chinese on the phone - this is the confirmation dialog where the first option means yes. Confirm with the power button. The device will wipe itself and reboot when complete. After the device is unlocked a custom recovery needs to be installed. Get the image from https://dl.twrp.me/oneplus2. To flash the recovery your phone has to be in fastboot mode again. After this, boot directly into TWRP by running sudo fastboot boot twrp-2.8.7.0-oneplus2.img. Do not boot OxygenOS as this will overwrite TWRP with the default recovery again. Follow the instructions of TWRP to prevent this. Exodos Android seems to be the only custom Android distribution which already does provide official nighly images for the OnePlus 2. Download the image from http://www.exodus-developers.net/exodus-5.1/oneplus2/. If you want Google surveillance, now is the time to get the Google Apps package. The OnePlus 2 is 64bit (ARM64) - make sure to get the correct download. I recommend to get the mini package from the Open Gapps project at http://opengapps.org/?api=5.1&variant=mini&arch=arm64. To install a custom Android a full wipe is required. So go to Advanced Wipe and select System, Data, Cache and Dalvik Cache. Put the downloaded ZIP files on the phone with adb. If your adb does not detect the OnePlus 2, then add the OnePlus USB vendor ID to ~/.android/adb_usb.ini with echo 0x2a70 >> ~/.android/adb_usb.ini and try adb devices again. Now select the Exodos ZIP file and apply it. After that has completed, the new system is basically ready. Now also select and apply the Google Apps ZIP file if you want Play Store and Google integration. Reboot, after the ZIPs have installed successfully. The first boot will take a couple of minutes. The OnePlus 2 works surprisingly well for me and i complely migrated to it after two days testing. I have encountered some minor software issues related to the early state of the OnePlus 2 custom Android. Only real issue is that the beast is really large and it does take a while to charge. Barcode / QR code scanners crash Android. Sometimes the hardware buttons stop working - workaround is to toggle the control style setting in General button options. The screen protector (applied by default) leaves smudges easily. New cables required (Type C). Device gets really hot when running CPU intensive stuff like enabling disk encryption. 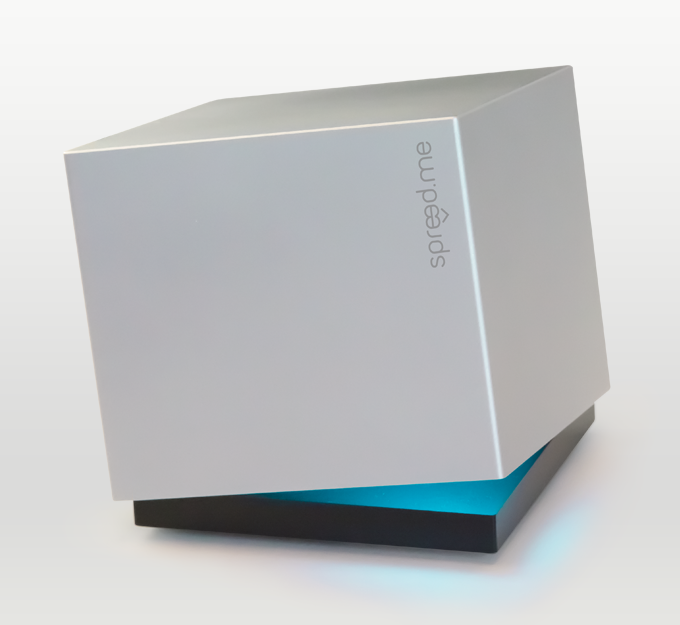 We are running a Kickstarter campaign to create the Spreedbox. The Spreedbox is a hardware device powered by ODROID-C1 and Ubuntu Snappy Core bringing the most private video chat and file exchange of Spreed WebRTC into your home. All set up and ready to use, including extra hardware support for random number generation and RGB LED signaling. The Spreedbox will catch eyes when placed at a visible location and lights will catch your attention when there are messages or calls. If your family lives all over the place you will love the Spreedbox as they can share their pictures and news without having them tracked, indexed, crawled and sold by service providers. They can leave you voice and video messages from all over the world without having to share anything with big data crawlers like Google or Facebook. With the Spreedbox you share nothing with any service provider - it all happens on the device. It was time to move to a new server. I took the opportunity to build a new personal page as well. This means i can quickly publish my stuff again. I combined this by trying something new and built this site with a static publishing framework named Hugo. Let’s see how this goes.